Twin-to-Twin Transfusion Syndrome is a disease of the placenta. During pregnancy, when a single placenta is shared by two twins, abnormal blood vessels may develop, essentially connecting the circulatory systems of the two individual babies. The result is an unequal exchange of blood flow. One fetus becomes a donor of blood to the other, creating serious complications that endanger the health of both babies. TTTS can also be manifested when there is a discrepancy in the way the placenta functions for each twin. Placental asymmetry describes a situation where one twin (the donor) has a smaller share of the placenta. The short answer: TTTS occurs in one third of Monochorionic monozygotic pregnanices. Let's see what exactly that means... Monozygotic, or identical, twins represent about one-third of all twins. These individuals develop from a single fertilized egg that splits several days after fertilization. More than half the time, this occurs four to eight days post-conception, and the two embryos will share a single placenta structure. In most cases, the twins will develop individual amniotic sacs, however, they will be encased within a single outer membrane, called a chorion. This the term "monochorionic" (mono=one, chorionic=chorion). 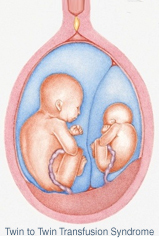 Only monozygotic twins can share a placenta, and only monochorionic monozygotic twins are at risk for TTTS since their circulatory systems may connect through the placenta. The causes of TTTS (Twin-to-Twin Transfusion Syndrome) are not exactly known, but one thing is certain: there is nothing you, as parents, did to create this condition. TTTS is not hereditary or genetic. It is not created by environmental causes,nor by any action or behavior of the pregnant mother. TTTS is a random abnormality of the placenta, in which shared blood vessels in the placenta shunt blood unequally between the two babies. What Can Parents Do When TTTS Impacts Their Twins? 1.) Create a medical plan of action based on educational materials provided by the foundation. 2.) Consult with a representative regarding treatment options, physician referrals and the benefits of diet and bed rest. 3.) Network with other families. 4.) Get a second opinion from specialists. 5.) Research the Internet for further information. 6.) Obtain approval for treatment options from your insurance company. 7.) Monitor your situation closely with weekly ultrasounds.